Picture a Day - The Holy Land Revealed: What Is Behind the Mysterious Sealed Gates of Jerusalem's Old City? What Is Behind the Mysterious Sealed Gates of Jerusalem's Old City? This summer the Yisrael HaYom newspaper reported on archaeological artifacts found by a British scholar after part of the el-Aqsa mosque collapsed in the 1927 earthquake that struck Palestine. 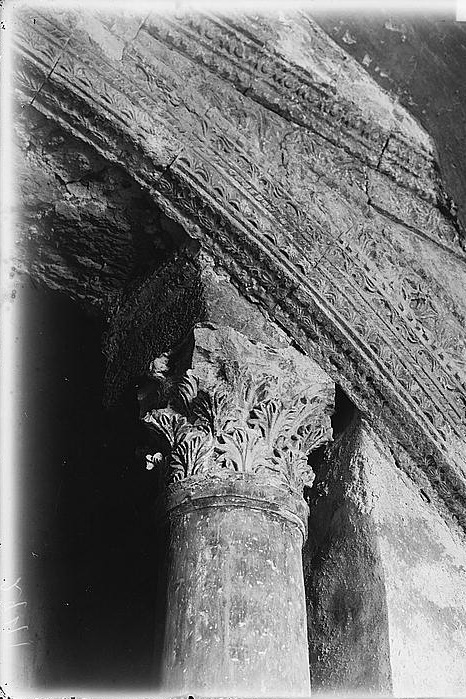 Reporter Nadav Shragai revealed that items from the period of the Second Jewish Temple were found but that their publication was suppressed. 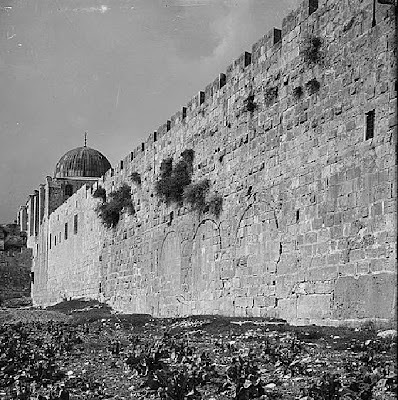 "Robert Hamilton, the director of the antiquities department during the Mandatory period in pre-state Israel, reach[ed] an agreement with the [Islamic] waqf that would allow archaeological investigation on the Temple Mount, for the first time ever, in the area where the mosque had collapsed." re-used by the Arabs to build al-Aqsa. "In the book that Hamilton later published, he makes no mention of any findings that the Muslims would have found inconvenient. It was no coincidence that these findings came from two historical periods that preceded the Muslim period in Jerusalem: the Second Temple era and the Byzantine era." 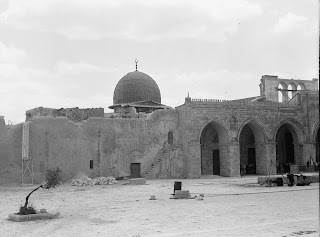 "Beneath the floor of Al-Aqsa mosque, which had collapsed in the earthquake, Hamilton discovered the remains of a Jewish mikveh [ritual pool used for purification] that dated back to the Second Temple era. 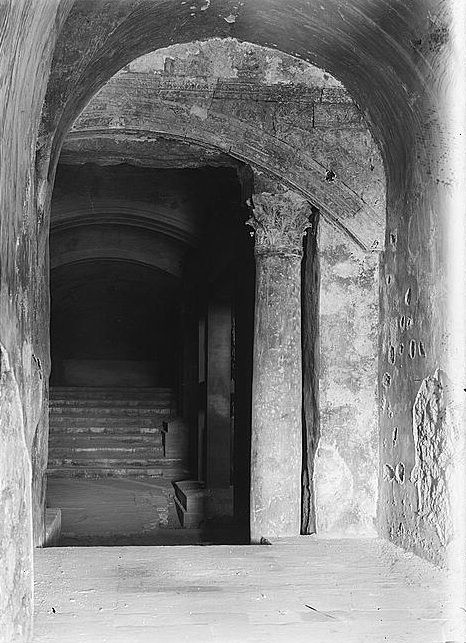 Apparently, Jews immersed in this mikveh before entering the Temple grounds." The collection includes two inexplicable pictures dated between 1920 and 1933 entitled "Ancient entrance to Temple beneath el-Aksa." The pictures were taken on the other side of the Hulda Gates, one of the major entrances to the Temple by pilgrims coming from the vast Shiloah (Silwan) pool. 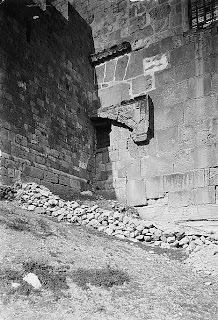 According to the Mishna, the gates were used for entering and exiting the Temple complex. 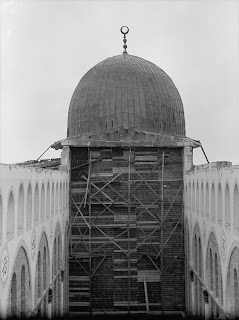 Clearly, the American Colony photographers entered the sacred area, like Hamilton, after the earthquake destroyed parts of the mosque in 1927 to take these rare photos. Otherwise, the area would have been off-limits. Original caption: "The Temple area. The Double Gate. Ancient entrance showing details of carving." The Hulda Gates date back to King Herod's Second Temple period, perhaps even to Hasmonean times. According to some commentaries, "Hulda" was a prophetess during the First Temple who apparently prophesized around the area where the gates were built (See Kings II, 22:14). 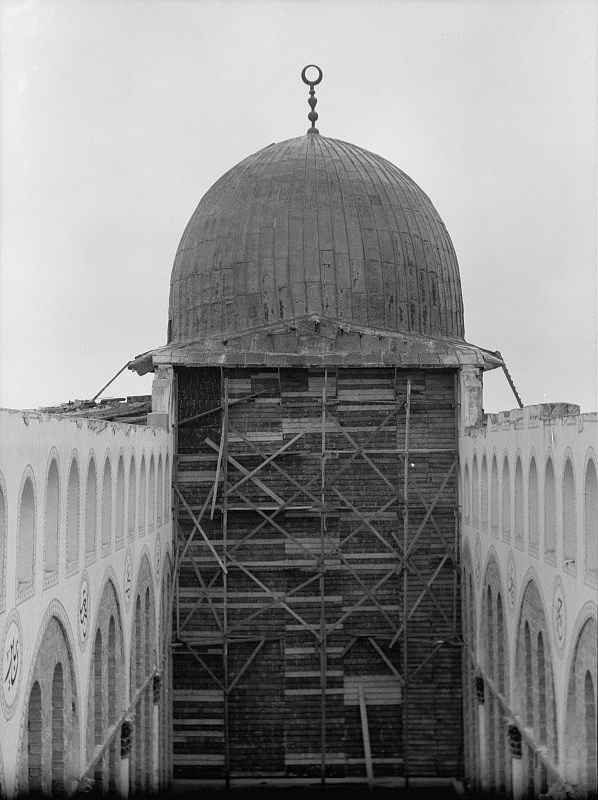 The Library of Congess collection also includes several pictures showing the extent of the damage to the al-Aqsa mosque in the earthquake. thanks for that and based on it, I posted this about the 1986-87 riots. Great catch, Len. Kol hakavod.